Museum Island – the island of grand architecture, remarkable artworks and astonishing exhibits––stands incomplete before us today. It is impossible to miss it: the hole in the center of Berlin, surrounded by the city’s greatest and widely known museums; the place where the Berlin City Palace (Stadtschloss Berlin) once stood. 580 years after its cornerstone was first laid, and 63 years after it was blow up by East Germany’s authorities, this baroque palace that was once home to Prussian royalty is being reconstrusted at a cost of around 590 million euros. And this is only the cost of rebuilding it – mainteinance costs are still to be considered. Under the lead of the Italian architect Franco Stella, the Palace is finally getting its original place in the city back – with the funding support from the federal government. Despite the major criticism of the project by ministers, academics and concerned Berliners, the German President laid the new foundation stone on June 12 this year. Welcome back, old days of glory? Stadtschloss Berlin symbolized German pride and magnificence for a long time. The history of the palace tells quite a tale: started in 1443 by prince-elector Frederick II of Brandenburg (also known as Irontooth) as a means to gain control over the trade routes on the river Spree, the Palace has lived through two World Wars and a series of monarchical changes. After Germany declared war on Russia on August 1, 1914, thousands of people gathered in front of the Palace waiting for William II’s historic speech of encouragement and preparation for war. After World War I, the Palace was bombed by the Allies on February 3, 1945 – it burned for four days, but without any permanent damage. Stadschloss Berlin had once again endured the course of time and history. After the division of Berlin in the aftermanth of World War II, the Palace ended up in the Soviet sector which would later become part of communist East Germany. That historic moment symbolized its end. Walter Ulbricht, head-of-state, had the Palace demolished in 1950 with the support of the communist party, the SED. Nowadays, the cabinet minister in charge of reconstruction stated that rebuilding the palace is a step toward healing the wounds inflicted by the Cold War division. However, this new project has not been met with overall excitement on every side. Much of the remaining East Berliner generation has fond memoried of the Palace of the Republic, the East German Parliament building that stood in place of the Berlin City Palace since 1970s. The Palace of the Republic was more than just a political building––it housed restaurants, a bowling alley and a number of social gathering spaces. Some East Berliners disagree with the modern reconstruction of the baroque palace in place of the Palace of the Republic––for them, this project represents an attempt to override the East Berlin history. Other criticisms involve issues with creating an architectual copy of the Baroque orginal in modern times, as well as the cost of the project in times of financial difficulty. However, the newly built City Palace will not be a mere imitation of an old ideal. According to Aya Soika (a professor at Bard College Berlin and art historian), the new City Palace is planned by Franco Stella as a “combination of old and new”, with some parts of the building modern and others in the Baroque style. Three sides will mimic the previous Baroque facade of the Berlin Palace, but the fourth wall is architecturally envisioned as a bridge between the past and the present. The reasons for reconstructing the Baroque facade in the first place are many – some related to distrust in contemporary architecture, others to a sense of injustice about the demolition of the Palace in the 1950s. Of course, there is also a sense of nostalgia for the time preceding the 20th century history. Setting all the controversy and criticism aside, this new Berlin City Palace will be more than a reminder of the past – it will represent a fresh model of culture and science. The building will be called “the Humboldt-Forum”, in honor of Germany’s perhaps most famous explorers, Wilhelm and Alexander von Humboldt. It will be a home to important academic works (mostly composed of collections from the Humboldt library), and host events for intercultural and educational dialogue. “In my opinion the decision to rebuild corresponds to an aesthetic preference and perhaps less to a desire to rewrite the past. However, it is necessary in this case to distinguish between form and function. The exterior does not really have much to do with what is going to be on display in the building. The “Humboldt Forum”, named after the two German humanist scholars –Wilhelm and Alexander von Humboldt – will function as a space for cultural institutions dedicated to education as well as to housing Berlin’s ethnographic collections and displaying the university’s collections of many different scientific and artistic objects. Cloaked with baroque exterior, the Humboldt University facilities in the reconstructed Palace will find themselves in a modern interior. This dichotomy was often brought up by critics as an illogical one. 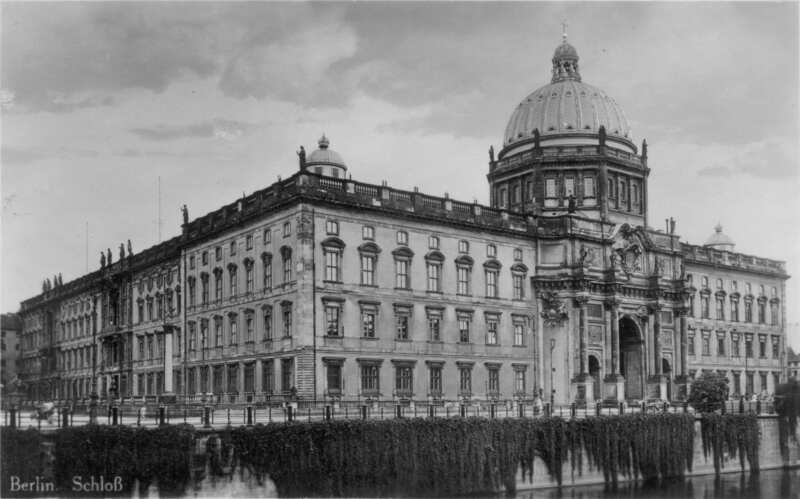 However, many seem to forget that the Berlin City Palace has been part of the Museum Island for a long time. Together with the museums surrounding it, the Palace completes a certain architectural whole in the heart of the city. According to Aya Soika, the priority should be that Humboldt University is “given this prominent space to represent its collections. The Humboldt University’s current buildings are a potpourri of spaces, built for different purposes in different times.“ The university collections hold many academic and scientific treasures which cannot be displayed at the university due to spatial and functional restrictions. “By exhibiting the collections to the public it will be possible to highlight the importance of the university in the history of the arts and sciences“, concludes Aya Soika. 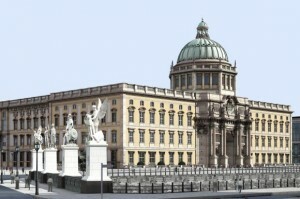 The controversy around the reconstruction of the Berlin City Palace will probably continue well into the process of its rebuilding – and perhaps even further. The place on which it is being (re-)built is historically ambivalent, bearing too many stories, historical periods and civic relevance. Sadly, that same space is now just one big, saddening hole at the center of the dreamy, often confusing and extremely paradoxical city of Berlin. Regardless of how we feel about it, Stadtschloss Berlin will once again be a part of Berlin. To dwell on old wounds or to move forward into the past-flavored future – I guess that is a choice left for each of us to make.